You don’t need a long list of ingredients for complex flavor. Basic, fresh aromatics like onion, carrots and celery make all the difference. Just cook them until they’re nice and tender. Briefly sauté the cumin, garlic and red pepper flakes to enhance their flavor. Then, add the remaining ingredients and gently simmer until the beans are tender and the flavors have melded. 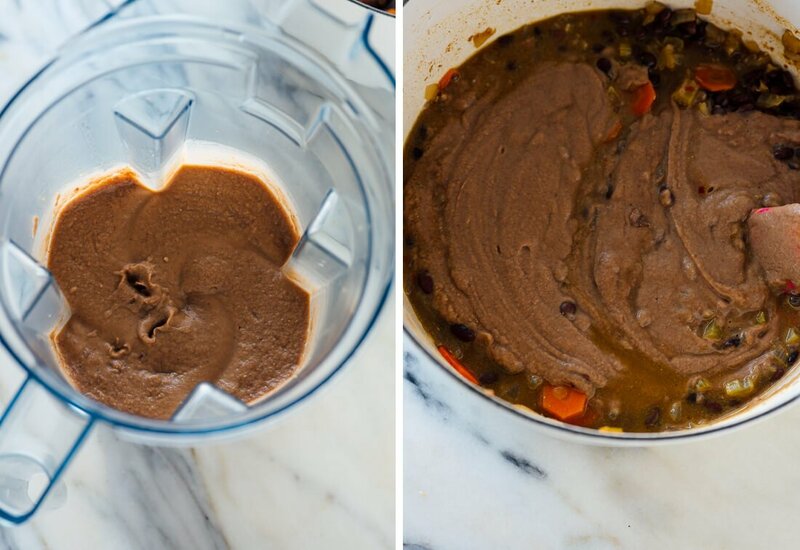 To achieve the perfect soup texture, purée a portion of the soup in the blender until it’s super creamy. Then stir it back into the pot. Ta da! 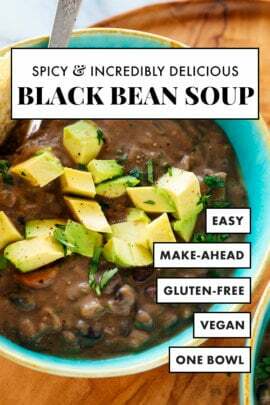 Now you have black bean soup with tender beans and a lightly creamy consistency, no cream required. I should mention that this recipe makes quite a lot of soup. Leftovers will keep well for four to five days, so it’s perfect for weekday lunches. You can also freeze this soup. I always freeze my soup in pint-sized mason jars, leaving room for expansion at the top and waiting to screw on the lids until the soup has fully frozen. Then I just defrost it later. 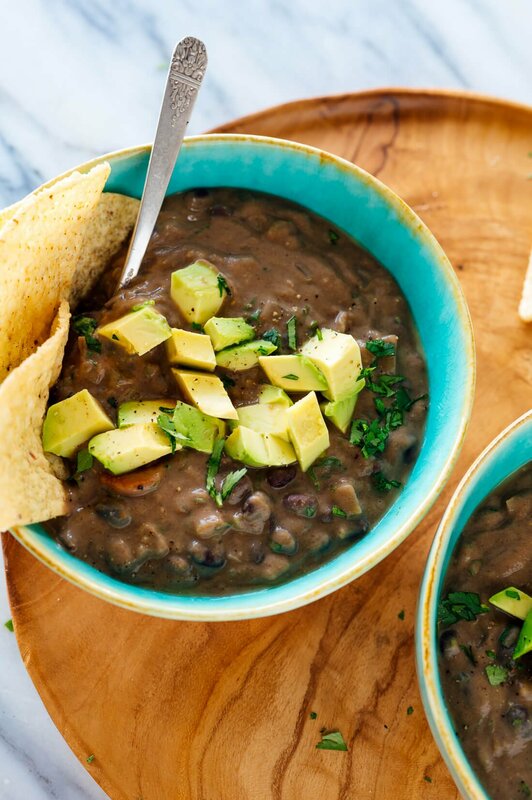 Rumor has it that this black bean soup turns out well in a slow cooker (Erin said she “basically just put it all in the crock at the same time and slow cooked it for about 6 hours”). If you give that a try, will you please let me know how it turns out? Please let me know how this soup turns out for you in the comments! I’m always so eager for your feedback and hope my recipes turn out wonderfully for you. Plus my cookbook has eight of my favorite soup recipes! 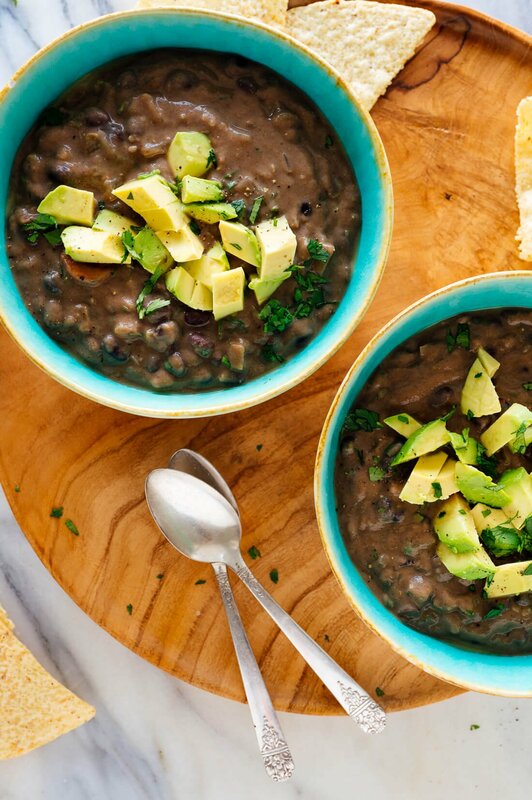 This healthy black bean soup recipe is easy to make with canned beans. 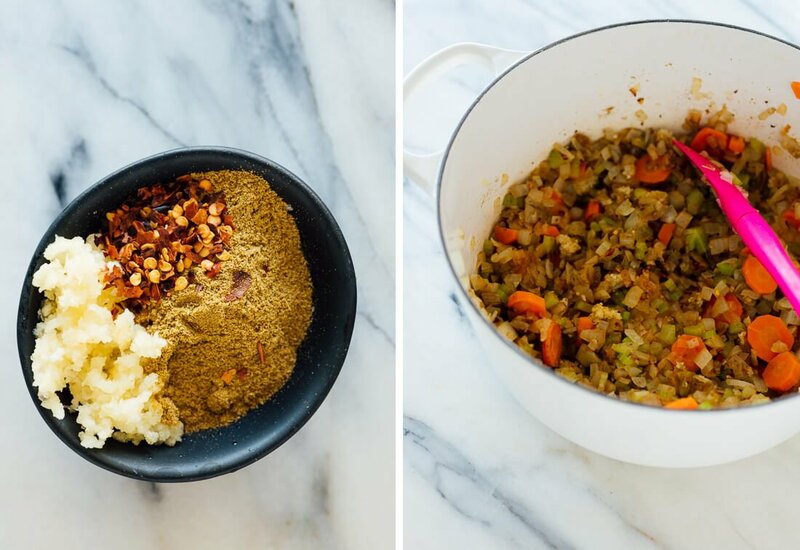 Thanks to some basic aromatics and Cuban spices, it’s incredibly flavorful and delicious. This soup is naturally vegan, vegetarian and gluten free. 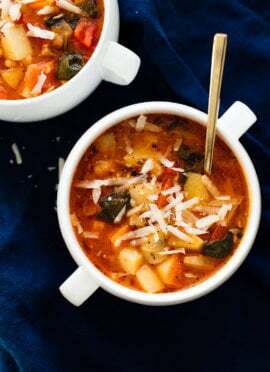 The recipe yields quite a bit of soup (6 to 8 servings)—it is easily halved, or you can freeze the leftovers. Suggested sides: Chunky avocado salsa, a little green salad, quesadillas or a grilled cheese sandwich. This recipe is very cumin-forward and the spice piece was one-note. I would try again adding a roasted poblano and jalapeño pepper and using a taco seasoning packet rather than the cumin. I’m sorry you didn’t love it! But thanks for the feedback, Becky. I added a can of fire roasted tomatoes, upped the red chili flakes, and omitted the cilantro. Topped it jalapeños, green onion, and queso fresco. So so so good. Filing without being heavy. 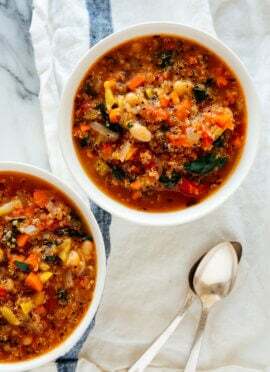 This is one of my go-to soups (along with the best lentil soup!). I’ve made it half a dozen time and it always comes out delicious! They are both great soups! Thanks, Susan for your review. 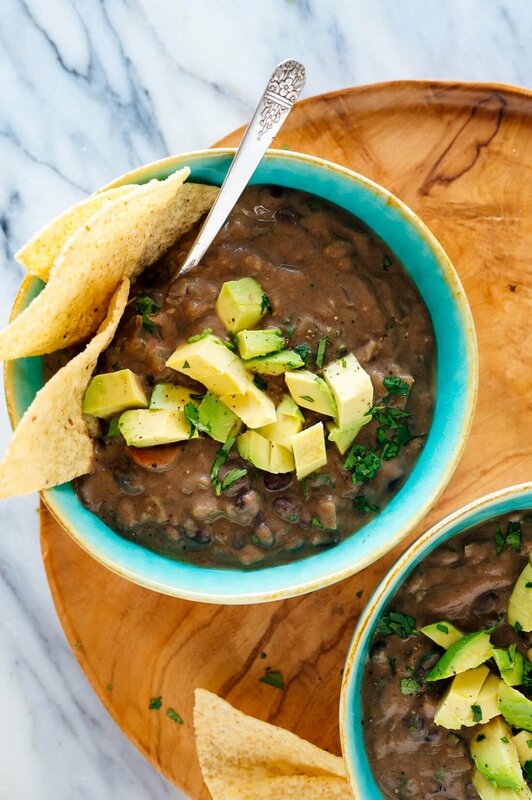 It’s incredible way to make vegan soup with black beans. Wow, this was great soup! I only had dried black beans in the house, so went through the soaking/cooking process [which adds a day to the prep – so much for “mmmm, I feel like having some black bean soup”]. Heartily recommend. I used the lime juice recommendation and served with a little bit extra and a little extra cilantro in the bowl. Thanks so much! How many cups of dried beans did you use? I like to use dried beans to cut down the salt and cost. Can’t wait to try this recipe! Hi Kate! I’m a big fan, and love your book. Willa, my dog, enjoys all the (dog friendly) veggie cast offs from the cutting board when I make your recipes. So, this soup was very tasty. I made it exactly as described and it was perfectly balanced to my palate, though I love the idea of introducing a little flavor from a poblano pepper as was offered by another commenter. Husband and teen daughter concur. Yummo. Will absolutely make it again. Thank you!! That all sounds wonderful, Judith! Thanks for the review. Thank You very much for this wonderful recipe. I also did it exactly the way in your recipe. Great flavor! I’m happy you liked it, Anne! I appreciate the review. Delicious! I thought the soup would be too thick, but it wasn’t. It was creamy. During Lent our parish is doing soup suppers. I made this for dinner tonight to practice for Friday’s soup supper. I’ll be back to your website for more tasty meatless soup recipes. Thank you for your review, Janet! My pantry didn’t contain as many black beans as I expected. Made it with half red kidney beans and half black beans. It was really delicious and not as unidimensional as pure black bean soup sometimes seems. Best of all it was dead easy to make. I’m glad you liked it with different beans! Thanks for sharing, Ian. I’m sorry you didn’t love this, Amber. Thanks for your feedback! 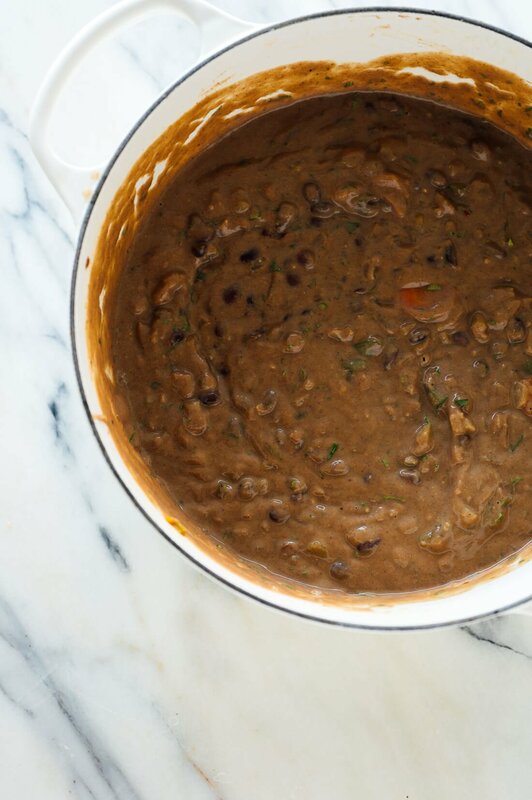 The recipe above, for Black Bean Soup, lists 4 cans of black beans, rinsed and drained. Why should we “rinse” the beans? I would think a small amount of the canned bean liquid, would be good nutrition in the soup being prepared. I do not understand this. Many other recipes requiring canned beans, instruct you to “rinse” and drain the beans. Please respond. Great question, Mary! 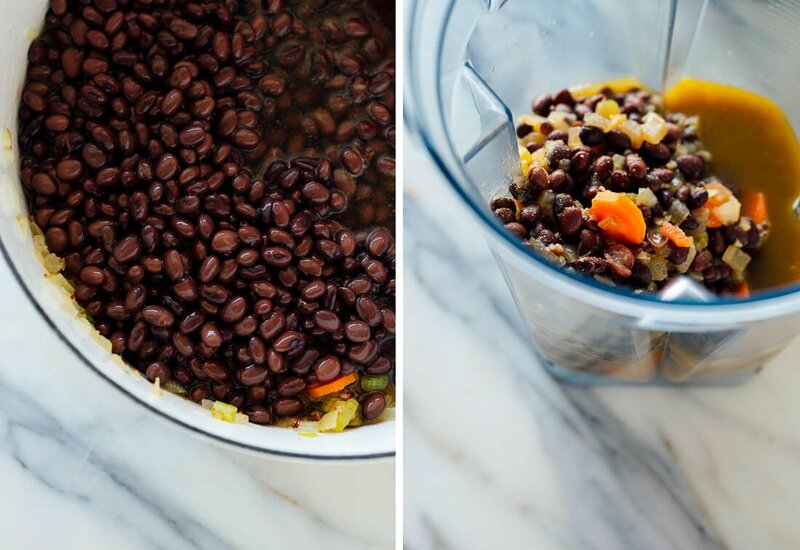 Rinsing the beans actually helps get rid of excess salt and improve the flavor of the dish. The starch in the liquid can impact the overall flavor. Great base recipe. I added a roasted jalapeno pepper to the blender. It added some smokiness to the flavor. Quite good. Additionally, I topped it with a hard boiled egg, finely chopped and some lime juice. Good stuff. Thanks for sharing. You’re welcome Brian! Thank you for your review. 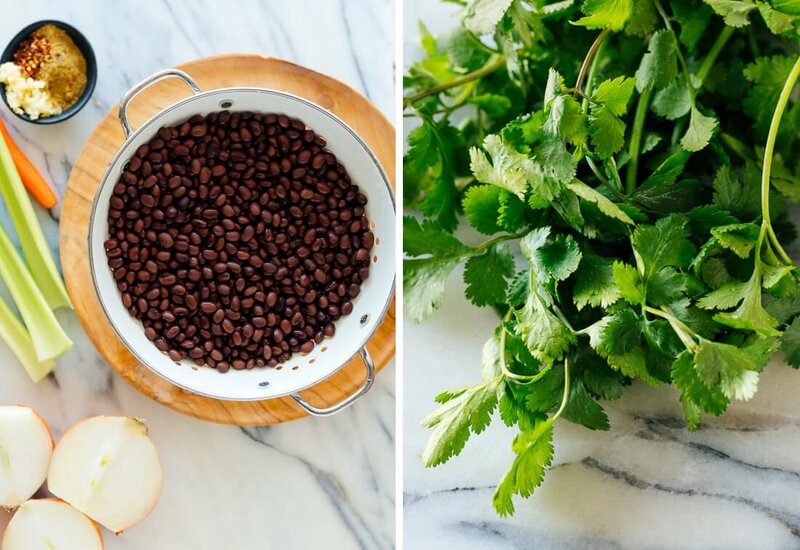 Thank you for your March 21st reply regarding how to use the can of beans, in making Black Bean Soup, (a great recipe). Since I love salt, even though I know many people try to avoid it completely, I will continue to use a good portion of the canned bean juice. Likely I will cut down on adding salt when adding fresh-ground pepper. And lastly, the starch in juice, I suppose is from the beans so that’s fine. I have always felt that draining and rinsing the beans is throwing away some of the nutrition of the beans. Again, thanks for your response. MH . Delicious, easy, and a party pleaser! I’ll add a bit more pepper flakes next time I make it. I used the lime versus the vinegar, which gave it an awesome flavor! Great! Thank you for sharing, Linda. I bet this is a great recipe and I’ll tell you I have loved your website and newsletter, but now that you have all these adverts it’s gotten unbearable to even look at! I have eight ads popping up, animating and jumping all over my page just trying to scroll down to get to the instructions. each time I try to move my page, they reline, shift and stop me from scrolling again. I have this on any phone that I try to view your site on. By the time I got to the how to, I was done. Hi Tanya, I’m sorry to hear about your difficulty with my site. That shouldn’t be happening! If you can, try clearing your browser cache on your phone. I hope that solves the problem. The ads are necessary to pay for the costs of running a large site and let me blog full time. I want everyone to have a pleasant experience on the site (it’s my baby). This was a great recipe! I didn’t have quite enough cumin on hand so I topped it up with a bit of a taco seasoning blend. Made some baked corn tortilla chips and some oven-roasted corn to go on top…this soup is definitely a keeper. Thank you for letting me know, Matt! Delicious! We like it best with lime juice. Hi Kate, I am a long time lurker (and cooker) and first time commenter. I just wanted to say that last week I made your vegetarian chili and it was the first meal prep I’ve EVER done that I actually enjoyed eating all week! 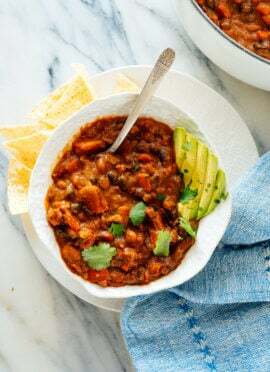 I just made your black bean soup last night with the addition of a jalapeno, a bell pepper, and some chili powder and paprika and I’m sitting here at work now eating it and realizing that I’ve got another meal prep on my hands I will enjoy all week! Thank you for gifting us all with your beautiful, tasty, and veggie filled recipes! I look forward to making many, many more! I’m so happy you finally commented! I’m glad you loved it and worked great for your meal prep. I appreciate the review, Marisa! I make this recipe all the time!! The non-vegetarians in my house are always skeptical when trying a vegetarian meal but they loved this! I make this recipe all the time!! The non-vegetarians in my house are always skeptical when trying a vegetarian meal but they loved this!! This soup is delicious as-is. My son-who-eats-nothing said so too! One suggestion– pay a lot of attention to the broth which is key to its flavor. I used Better Than Bouillon No Chicken Base because its flavorful and salty in a good way. You could probably add more carrots and celery to increase the nutritional value. Broth can really impact your soup, depending on taste. I agree. Thanks for sharing, Meredith! I finally made this last night exactly as written and it was incredible! My fiancé said it was the best black bean soup he’s ever had!